When Link is returned to the future world of Hyrule in OoT, the first person he meets is a skinny, sun-bitten young man, who introduces himself as Sheik, Survivor of the Sheikahs. 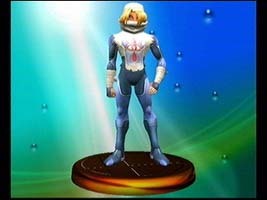 Sheik has red eyes, blond hair, tan skin, and a stringy, muscular body. He wears the same kind of clothes that Impa does -- tight-fitting, flexible armor/clothes, with the Sheikah symbol displayed proudly on his chest. This same symbol is worn by Impa and can be found on the Mask of Truth and Gossip Stones. His head, arms, and fingers are wrapped in gauze, and his vest is threadbare. This get-up gives Sheik the appearance of having traveled all over Hyrule, doing many things. Sheik acts as a mysterious guide for Link, appearing when least expected, and disappearing just as quickly. Using his harp, he teaches Link songs that allow him to warp to all of the temples in Hyrule. After teaching Link a lesson with his poetry, and teaching him a song, he disappears using Sheikah magic, before Link can learn any more about him. He casts a flash spell, or calls up some kind of distraction, to disorient Link before disappearing. While Link battles in the temples, Sheik goes around Hyrule, doing deeds that oppose Ganondorf's power. For example, he saves Princess Ruto from under the ice, and attempts to keep the shadow spirit from escaping from the Kakariko Village well. When Link is at last old enough to awaken, Zelda, still disguised as Sheik, meets him in the Temple of Time. By this time, the Sheikah are thought to have died out, and Impa is incognito. So, Zelda takes advantage of this situation to claim herself to be the last surviving Sheikah. Whether the Sheikah have really died out, or if they are just in hiding, is not known. The nature of Zelda's disguise is also mysterious. She probably uses the Triforce of Wisdom to produce the disguise. When she takes off the disguise, the Triforce of Wisdom symbol appears and spreads outward, which indicates she was using its power to disguise herself. It is also unclear whether the Sheik disguise changes Zelda's body physically, or whether the disguise is like clothing that just covers the real body. 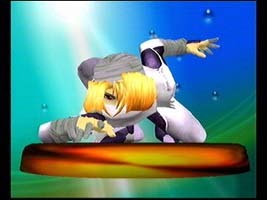 Sheik is a playable character in Super Smash Bros. Melee, together with her alter ego Zelda, to whom she can transform whenever she wants to. She is one of the fastest characters, but on the other hand she is really easy to control. She can also jump (or fly!) high distances. Her ninja-like-movements are weak, but really fast, so they can be easily chained. This is Zelda's alter ego. If you see Sheik, please give him my thanks, OK? hide from the King of Evil. Here are several quotes by Sheik in various locations. Sheik appears near any of the 6 temples in Hyrule. who dwell in the five temples. play the Minuet of Forest. But there are still other Sages who need your help. return the Master Sword to the Pedestal of Time. Temple is the source of the curse. melody that leads to the temple. Did Ruto want to thank me? water. All is as it was here. Impa is one of the six Sages. this, the Nocturne of Shadow!! 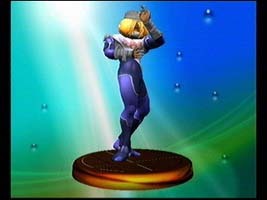 Sheik's name is written in katakana as SHĪKU in Toki no Ocarina. Compare this to Sheikah, which is written in Katakana as SHĪKĀ. This indicates that the name is pronounced the same way as the English word "she." "Sheik" is the standard spelling in the American and French versions. In the German version, however, Sheik's name is spelled "Shiek." This is because, in German, "ei" is pronounced as in "reign," while "ie" is pronounced as in "belief." To preserve the original pronunciation, the name had to be changed to "Shiek." Note that Sheik is referred to as "he" and a "young man" in OoT, so the proper pronoun to refer to Sheik is the masculine one. 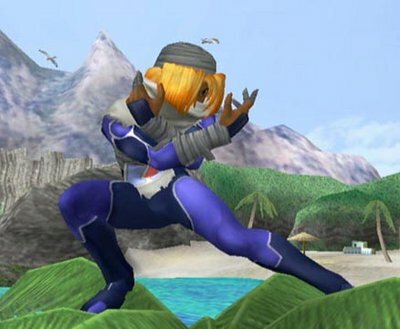 There are subtle differences between the official art and the in-game model of Sheik. Very small things, such as his fingers being wrapped a little bit differently, and the light/dark blue pattern of his clothes being a little different.